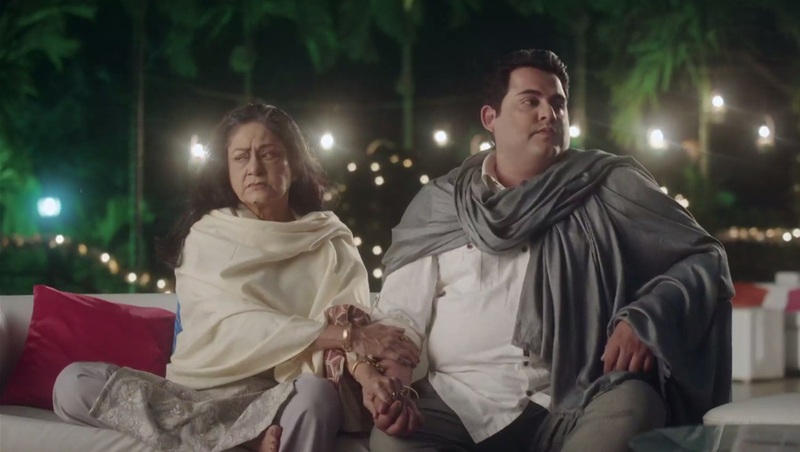 Star Plus’ new show Dil To Happy Hai Ji aired its 1st episode on January 15th 2019. Coming up from the factory of 4 Lions, the show revolves around a girl who wants to stay happy and keep others happy. It’s wedding time in the Mehra house. The main protagonist, Happy wants to dance in her cousin sister’s wedding functions despite being a clumsy and bad dancer. She is advised by her cousins not to pull the stunt on stage. Yet she does that and falls off. But then handles the embarrassing situation by cracking jokes on herself and making it a fun moment. This angers her uncle (Taya ji). He blasts off at Happy and her fatherless family. Happy, her mother Sandhya and sister Smiley are always humiliated by Taya and Tayi ji owing to their helplessness. On the other hand, the elder cousin brother of the groom takes a liking in Happy. He supposedly is the ‘good’ guy who is responsible, kind hearted and a successful chartered accountant. But he has a brother who is not as good as him. Named as Rocky, he is the spoilt brat in the family, who lives a reckless life, throws manners out of the window and apparently has some great temper. 1. The show started off with the plot of a wedding. And that’s always the most ideal way to start a show on television. Wedding brings the whole cast together to get introduced in the most intricate way. 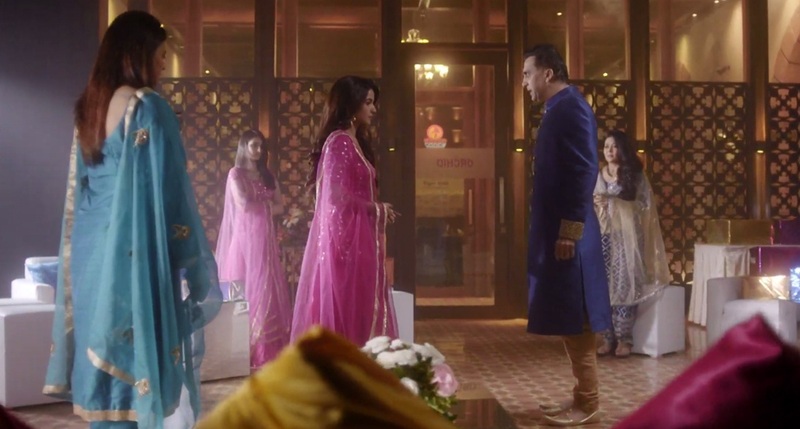 Also its interesting to watch a wedding plot due to the conflict of characters, ideologies and personalities in one single frame surrounding one single occasion. Moreover, weddings are the favourite events of the TRP audience. 2. 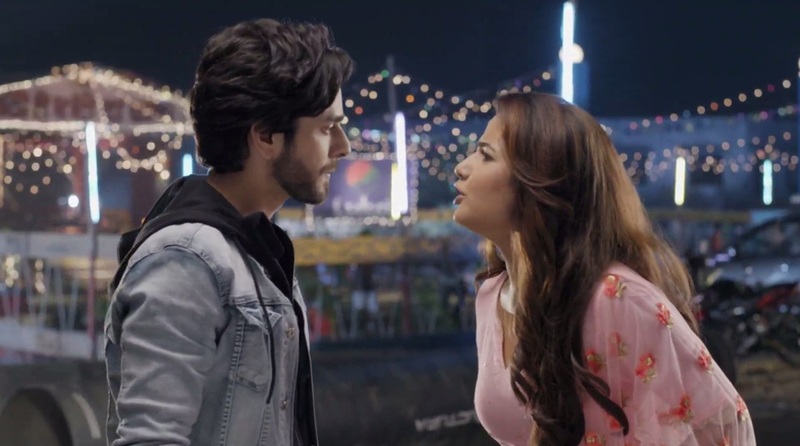 Jasmin Bhasin as Happy is a delightful watch. After two shows on Zee and Colors, this Star Plus show is her third. And the actress seemed to have improved a lot from her stint in Tashan E Ishq to now. Her energy as Happy on screen spreads an aura of positivity. In short, she is very energetic and impressive on screen. 3. Keeping up the usual standards of 4 Lions, the locations, cinematography and the set decoration is absolutely vibrant and stunning to look at. 4. A girl who laughs a lot and cracks jokes aren’t good or they lack dignity – This social taboo or stigma is very subtly pointed out in the show. The elderly characters of the show are shown judging Happy’s character on the basis of ‘how she laughs so much’. It will be interesting to see how Happy makes them think that boys and girls have equal rights to be happy and express their happiness as well. 5. Chintu, the good natured and cute looking chartered accountant is someone who might have a lot to tell is too in future. Let’s hope this character may turn out to be the voice of reason in the show later. 6. Rocky, the spoilt brat, reminded us vaguely of the initial days of Damon Salvatore played by Ian Somerhalder in The Vampire Diaries. Some of his expressions and smirk are a reminder of Ian’s naughty expressions. 7. The face off scene between Rocky and Happy in front of the police was a fun watch. That was some great demonstration of their upcoming ‘takkar’. 1. 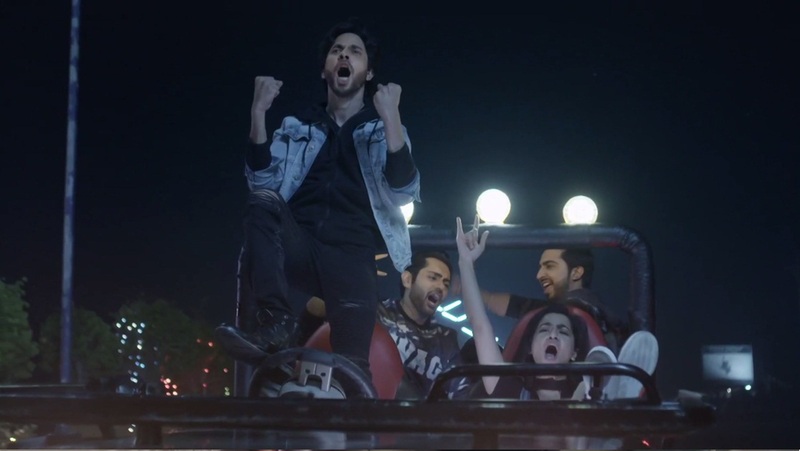 The fact that this is Jasmin Bhasin’s third love triangle is a little put off. From the story of the show, it’s quite clear that both the good boy and the bad boy is going to fall for Happy in the show. That staunchly reminds us of the plot of Tashan E Ishq again. 2. 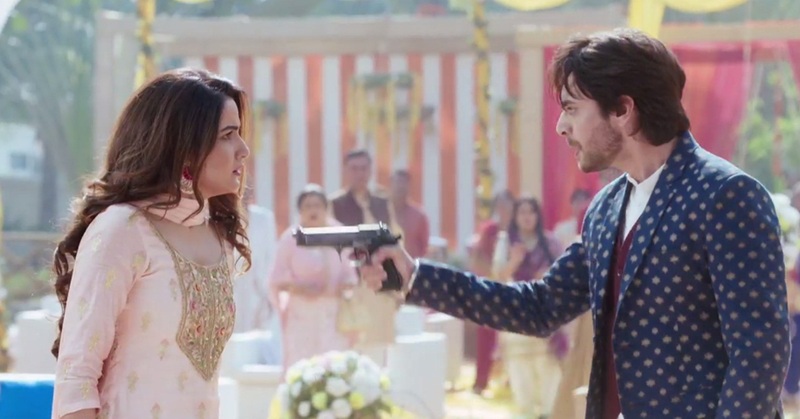 The precap shows Rocky holding Happy at gunpoint in front of the wedding invitees. As much as that creates a drama galore situation, it just jolts you and reminds you that it’s a Gul Khan show where the hero is ought to have some nerve wracking and uncontrollable temper. 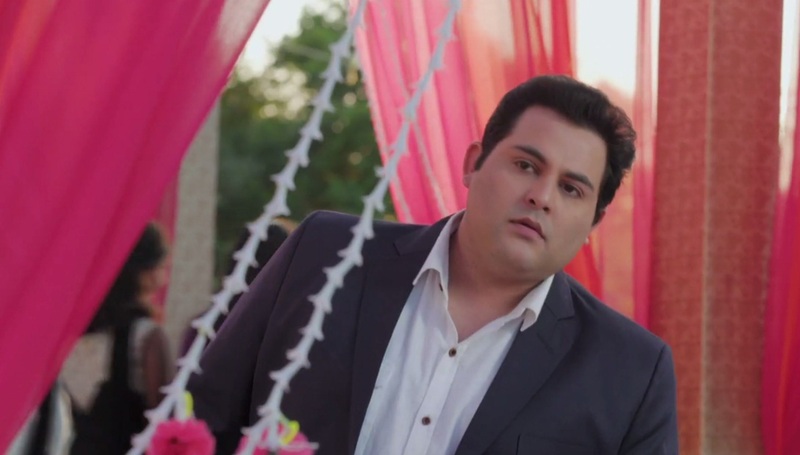 All in all, we would say Dil To Happy Hai Ji had a good start with its premiere episode. With various shades of characters, the show has the potential to dish out good content. Since Gul’s heroines have bad taste in men, obviously she would like the bad guy!!!! The poor good guy would be dumped!!!! The same bubbly majboor heroine and bigad huya hero!!! !